In 2016-17 — the year in which high-value currency was scrapped — gross value added (GVA) by the industry grew at the slowest pace since the Narendra Modi government took over, showed latest data released on Thursday. The provisional results of the Annual Survey of Industries (ASI) for 2016-17 showed that GVA grew by 7.2 per cent at current prices in FY17, down from 9.3 per cent in FY16 and 9.4 per cent in FY15. By comparison, the Central Statistics Office (CSO) had estimated manufacturing GVA rose higher at 10.1 per cent at current prices in FY17. Investment activity is another area of divergence between the two estimates. Gross fixed capital formation (GFCF), which connotes investment, contracted by 2.7 per cent in 2016-17, after growing by a robust 17.3 per cent in 2015-16, ASI data showed. In comparison, GFCF, at the aggregate level, had grown by 11.1 per cent in FY17, according to the CSO. The annual survey of industries covers all factories registered under sections 2m(i) and 2m(ii) of the Factories Act, 1948. These sections refer to premises, wherein ten or more workers are working with power or 20 or more workers are working without power. This definition was slightly modified because of the amendment of the Factories Act, 1948, for the states of Rajasthan and Maharashtra, which was applicable ASI 2015-16 onwards. “Section 2m(i) has been modified, i.e., from 10 or more workers with power to 20 or more workers with power and Section 2m(ii), i.e., from 20 or more workers without power to 40 or more workers without power,” noted the ASI. 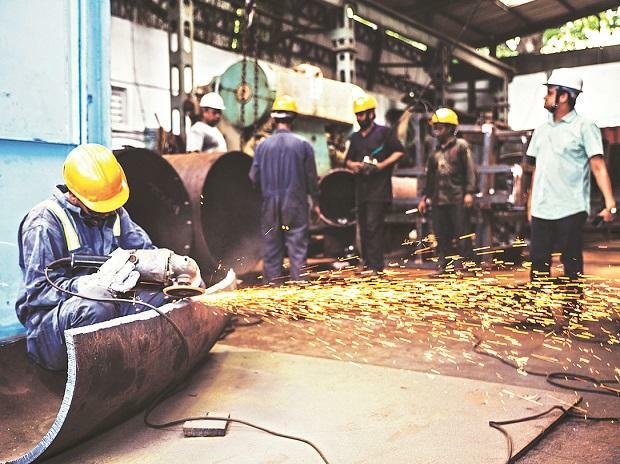 But even as GVA growth slowed down in FY17, the number of workers employed by factories rose by 4.7 per cent to 11.6 million in FY17, up from 1.11 crore in FY16 — the fastest pace in the last five years. But wages paid to these workers grew by 11.2 per cent, in line with the growth over the past few years. On the other hand, profit growth slumped to 4.2 per cent in FY17, down from 11.5 per cent the year before. A region-wise breakup shows that in urban areas, GVA by industry grew 8.4 per cent in FY17, against 6 per cent in rural areas. However, the number of factories in urban areas fell to 139,222 in FY17, from 141,037 in FY16, even as workers employed rose 4.5 per cent.